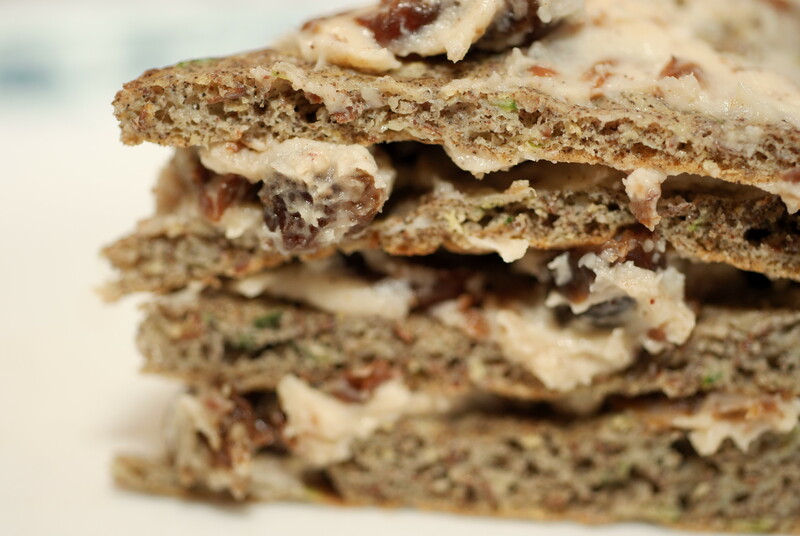 I have to thank Andrea Drugay for posting a recipe for Easy Flaxseed Wraps on her blog, which inspired a week-long obsession and several new recipes. 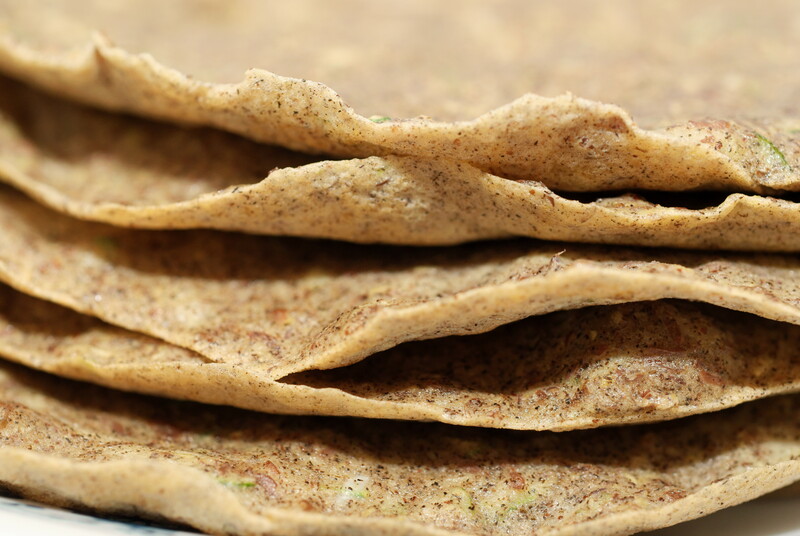 The original recipe called for 100% flax, and it’s a delicious wrap, but in order to create a gluten-free crepe that I was happy with for breakfast or dessert, I decided to try using a little buckwheat flour as well. And because I’m always looking to incorporate more vegetables into my family’s diet, I tried first grated carrot, then grated zucchini and settled on the latter for this recipe. 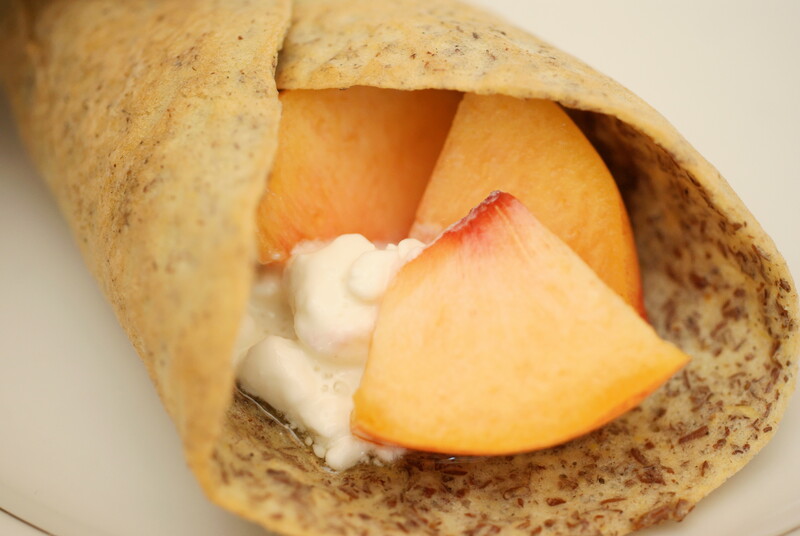 The crepes are simple to make, and the mascarpone makes them quite memorable, but it’s totally optional – the crepes are marvelous on their own, or filled with fresh peaches and cottage cheese or just bananas and a sprinkle of cinnamon for a healthy breakfast. No sugar is called for in the crepe batter, but a little pure maple syrup is of course a tasty complement if you’re in the mood for a sweeter treat. At the bottom of this post you’ll find a recipe scaled down to serve 1 person (2 small crepes), and more pictures of some of the many crepes I made this week. In a small saucepan, combine raisins, cinnamon, clove, water and juice. Bring to a simmer and cook 6-8 minutes, until raisins are plump and liquid has been absorbed. Assemble crepe ingredients while raisins are cooking. Remove from heat, remove and discard clove and let cool. In medium bowl, whisk together buckwheat flour, flax meal, baking powder, cinnamon and salt. Pour in melted coconut oil or butter, add egg, water and zucchini, and mix well. Preheat a small nonstick pan over medium heat and lightly coat with coconut oil (a couple drops will do). Once pan is hot, pour ¼ cup crepe batter into the pan and quickly tilt the pan to evenly distribute the batter over the pan. 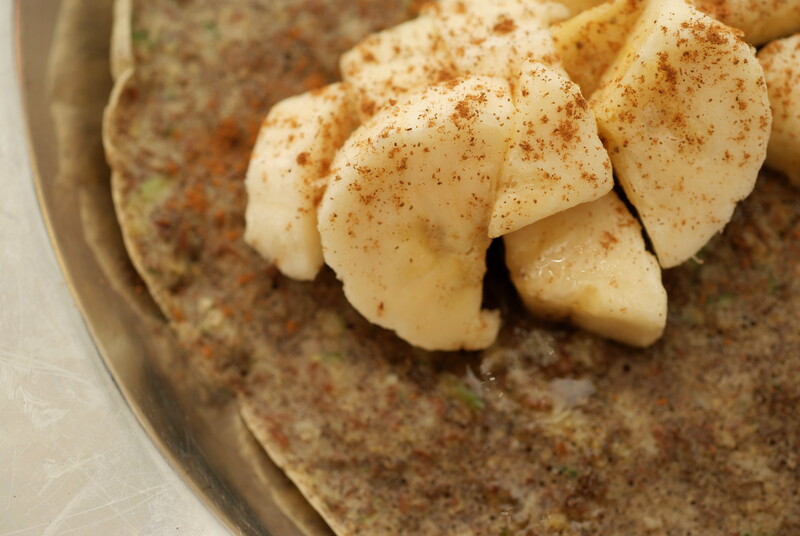 Crepes should be thin – use just enough batter to cover your pan. Cover the pan and cook approximately 1 ½ – 2 minutes or until the batter has cooked through (no need to flip). Move crepe to a plate, lightly oil your pan again and repeat. Recipe yields 8 crepes. Once you’ve given the raisin mixture a few minutes to cool (Remember to find and discard the clove! ), pulse in a food processor 30 seconds. Move to a small bowl and fold in mascarpone, mixing well. 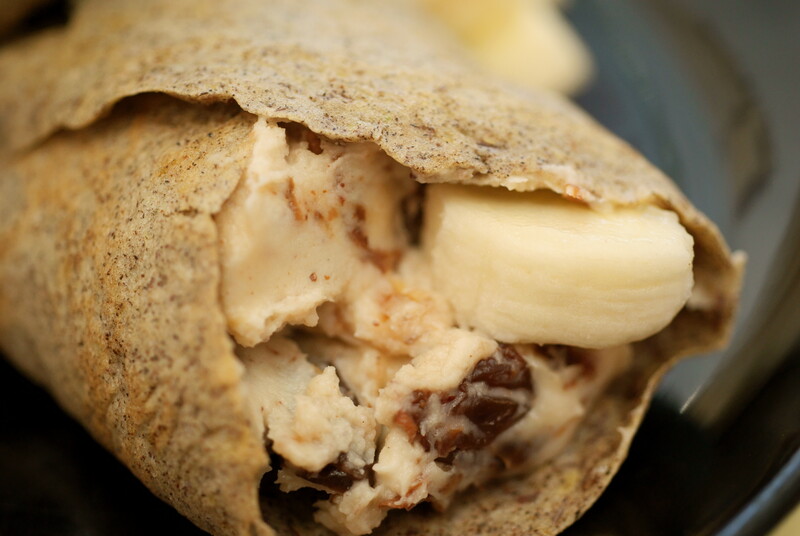 Serve crepes with the raisin-mascarpone cream, sliced bananas and a drizzle of maple syrup. Or forget the bananas and create a crepe cake, spreading the raisin-mascarpone cream between 4 or more layers of crepes and slice like a cake. Thanks for the recipe. I’d like to try it. I put shredded zucchini in everything! But I’m new to gf–is buckwheat flour gluten free? Yes, buckwheat flour IS gluten-free. Despite the name, it has nothing to do with wheat; it’s related to rhubarb. I hope you get a chance to try it, and if you do please let me know what you think!